This is especially true when you have taken the time to create, print and send the invites yourself. The good news is you do not have to be a professional publication designer to do so. With the following invitation templates, all you need is a copy of Microsoft Publisher, a printer and some paper. Note: When you click on the download links below, no preview will be available because the items are MS Publisher files. You will need to download the files (click the downward facing arrow or use the keyboard shortcut Ctrl-S) and open them in Publisher to view. This invitation card template is ideal for an adult birthday party. The front includes a blackboard-like background and writing in fonts that resemble chalk. 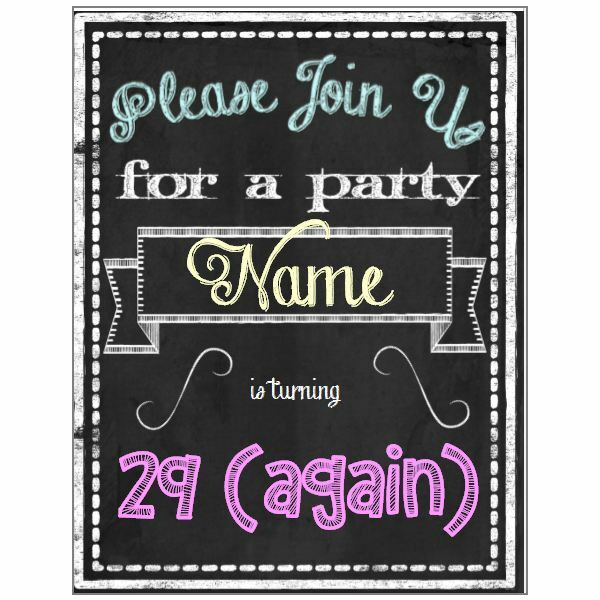 Type the guest of honor’s name and age into the appropriate text boxes and change the “chalk" colors if you choose by selecting options on the Font menu. Inside, the invitation has placeholders into which you can type important details, including the date, time and location of the party. You can add other details here as well or add a text box on the left panel to enter lengthier information. Finding a fun, gender-neutral invitation for a child’s party can be difficult, especially if you want to include your kiddo’s name and age on the cover. 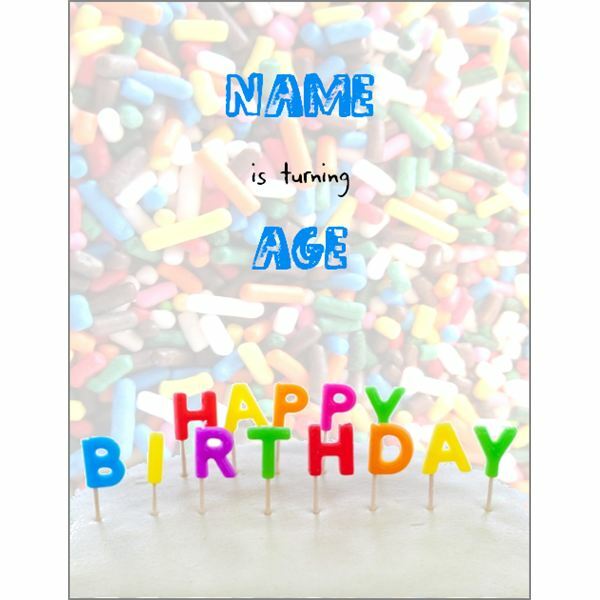 This template solves the problem, with a festive birthday cake and sprinkles cover that includes sample text over which you can type the birthday boy or girl’s name and approaching age. This text is in a fun, childlike font in a shade of blue that matches one of the candles on the cake. You can change the font color or style, should you choose to do so. The inside of the card includes lines for pertinent information, making it easy for you to print or even handwrite the party details onto the invitations. 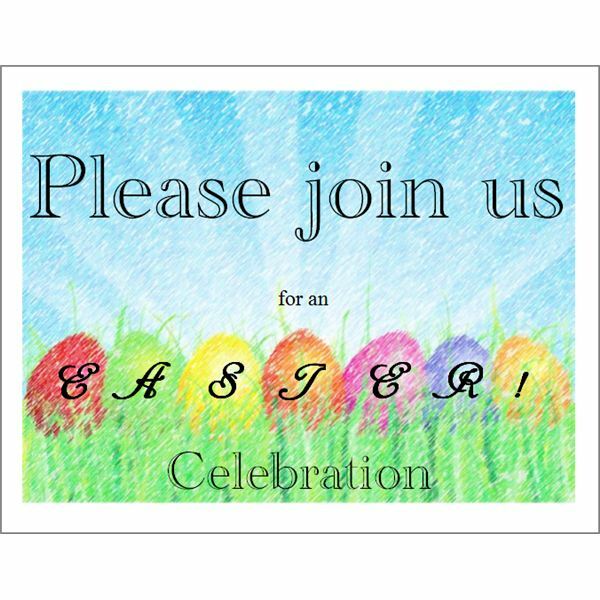 An Easter gathering may include anything from attending a sunrise church service to painting or hunting for eggs to enjoying a mouth-watering brunch, and this invitation is completely customizable, enabling you to tailor it to your get-together. The cover of the card features several colorful eggs nested on green grass with a bright blue-sky background. The text reads, “Please join us for an Easter! celebration," with “Easter!" spelled out across the seven eggs. Modify the text to describe your event or leave it as-is and include further details inside. If your event doesn’t fit into any traditional category, opting for a basic but elegant blank card might be your best bet. 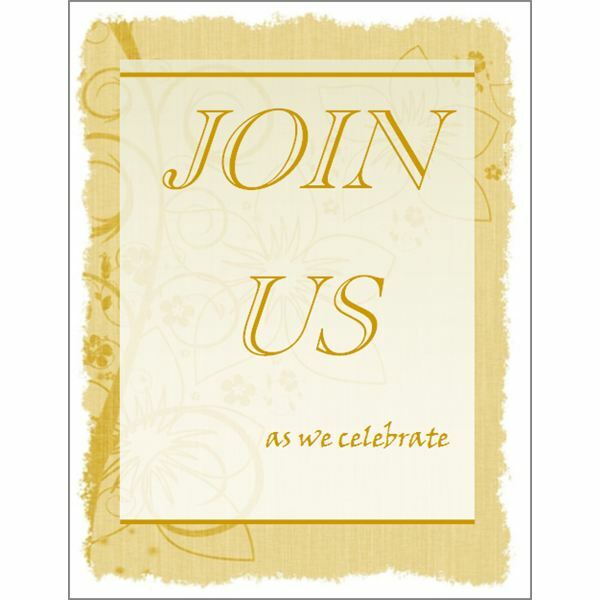 This invitation features a stately gold-toned cover with the words, “Join us as we celebrate." Customize this text as you see fit to inform others of your upcoming gathering. The inside is blank but for the word “details" showing you where text boxes are placed, so that you may enter all of the information you wish to share. The price of postage is ever increasing so if you are on a budget, wish to conserve paper or want to save time folding, inserting and sealing cards and envelopes, you may choose to create a postcard invite. 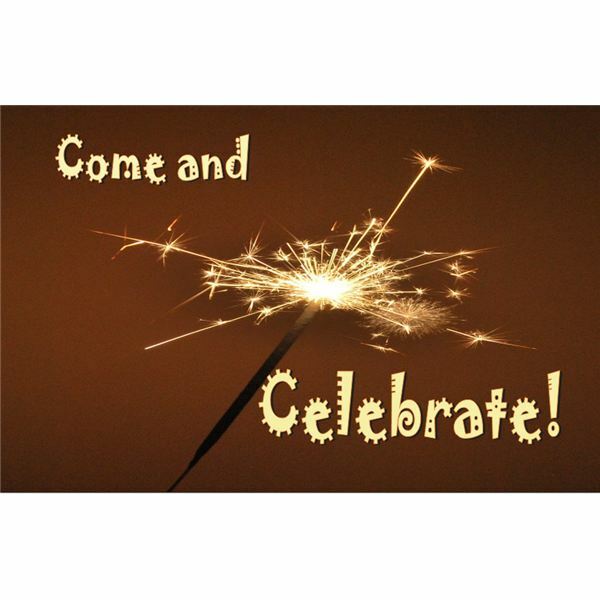 This template features a bright sparkler on the front along with the words, “Come and Celebrate" in a festive font. Simply select this sample text and type over it if you wish to personalize or customize the postcards. The back of the invitation includes spaces for party details as well as your mailing information. You can add a text box and type in recipients’ names and addresses or even perform a mail merge to save more time. These invitations are quarter-fold cards, although they vary in orientation. Print the cards on a standard sheet of paper or card stock. There is no need to use a duplex printer or print on both sides of the cards. After printing, fold the short ends of the card together so that the cover is on one side and the interior is on the other. Then fold the card in half once more. Once you’ve started creating and printing your own invitations, you’ll never want to settle for store-bought cards again!